Have $53,000 just laying around, burning a hole in your wallet, and want to spend it on something that will help you relax? 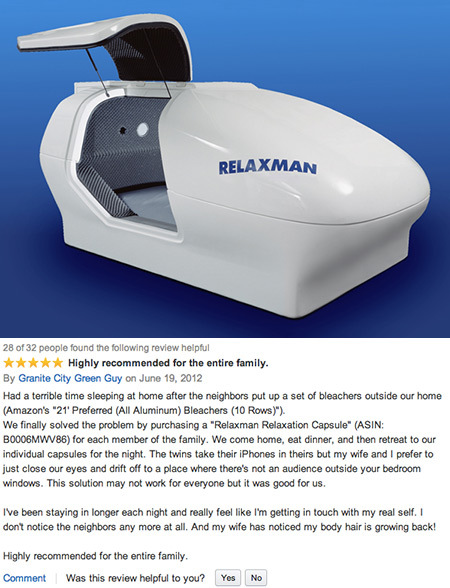 Then check out the Relaxman Relaxation Capsule. According to the manufacturer, it’s “completely heat, light, and sound proof, providing total isolation for the ideal environmental therapy. Inside, the heated water mattress stays at body temperature while soothing, preprogrammed music and lights take you into a deep state of relaxation.” Product page. 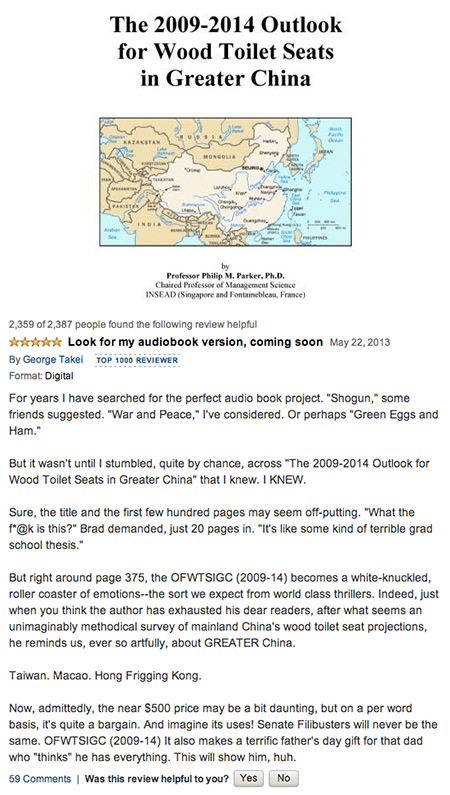 Continue reading for more strange (yet real) items you can actually buy on Amazon. Orcon’s LB-C1500 Ladybugs supposedly eat aphids, mealy bugs, scale, leaf hoppers, various plant eating worms and other destructive soft bodied pests, when released at sundown (because they don’t fly at night). And they keep on eating until the bad guys are gone, laying their own eggs in the process. 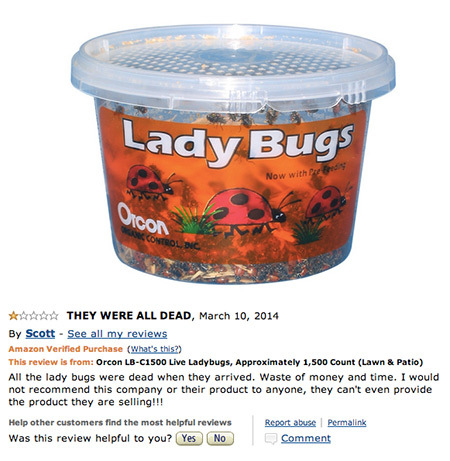 When new pests arrive, fresh ladybugs will be waiting.Product page. The 2009-2014 Outlook for Wood Toilet Seats in Greater China is probably the most confusing and equally strange book you’ll ever come across. According to the author, he “describe[s] the methodology used to create the latent demand estimates for wood toilet seats in Greater China. Since ICON Group has asked [him] to apply this methodology to a large number of categories, the rather academic discussion below is general and can be applied to a wide variety of categories and geographic locations, not just wood toilet seats in Greater China.” Product page. 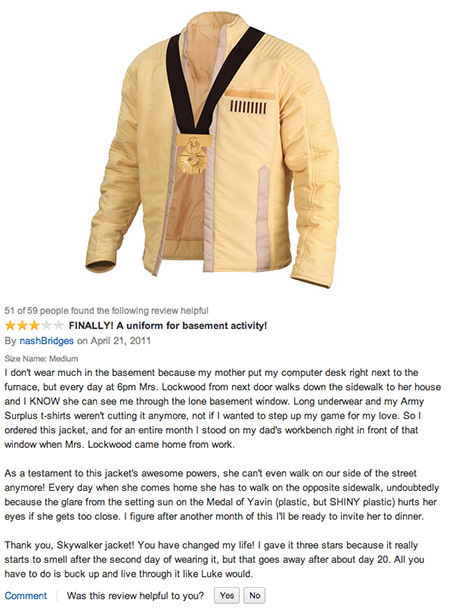 The Officially Licensed Star Wars Luke Skywalker Ceremonial Jacket with Medal Of Yavin is basically the wellknown ceremonial jacket that Luke Skywalker wears in episode IV after destroying the Death Star and saving the rebel base from a horrific fate. Constructed of nylon with a polyester lining, this coat is an athletic cut, and features no zipper. The ceremonial medal that Luke was rewarded is included with this jacket. Product page. The Zenith Men’s 96.0529.4035/51.M Defy Xtreme Tourbillon Titanium Chronograph Watch features solid, but lightweight, titanium construction, and high-end features such as automatic movement, hesalite crystal and a deployment clasp. It’s said that one night after Jacot finished a movement he considered almost perfection he went out and looked at the stars and he felt the stars almost speak to him. He saw the gigantic constellation turning around the Pole star similar in the complexity to the movements of the pivots and the wheels on their axes. He decided then to call his new movement and its manufacture after the word that designates the highest point in the universe, ZENITH, the star was adopted as a brand symbol as it is still today. Product page. 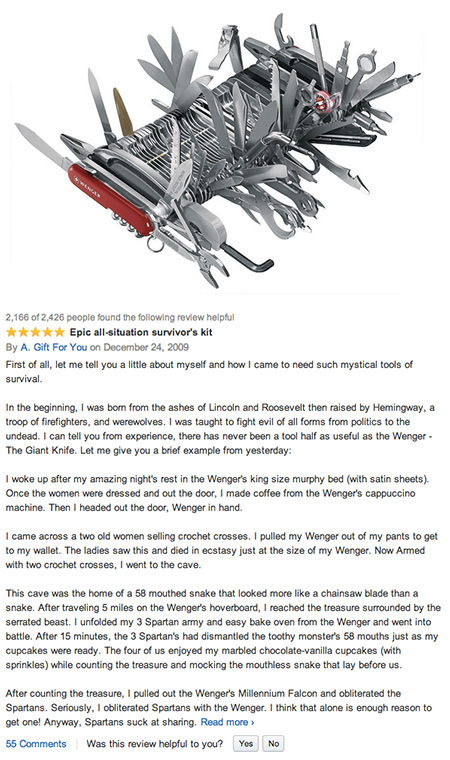 Wenger’s 16999 Swiss Army Knife Giant is designed with an incredible 87 implements that perform 141 functions, making it the only tool you’ll need to get any job done. Whether in your pack or on display, the Giant Knife is sure to be a conversation starter. Product page.